Who says HP Chairman can only use HP computers? 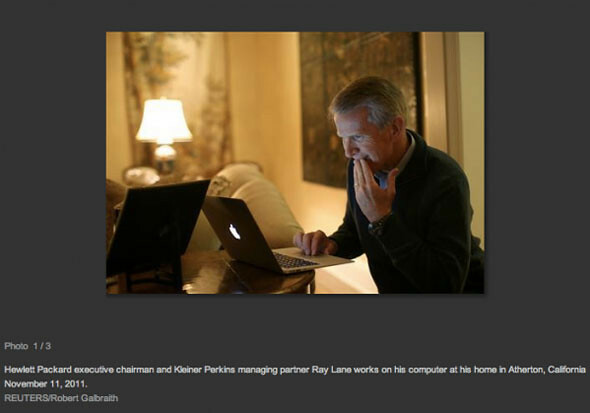 Apparently HP’s newly appointed Chairman, Ray Lane is an Apple Macbook Air user. The photo was featured in this article by Reuters. The article was about Ray Lane and his responsibility to bring change to HP. (Reuters) – When Ray Lane took over as chairman of Hewlett-Packard Co a year ago, he was looking forward to working with longtime associate Leo Apotheker, who had just been appointed CEO to repair the damage done by the messy departure of Mark Hurd. One Response to "Woops! HP Chairman Is A Mac User"
He looks confused looking at his Mac. Maybe this was someone giving him the Mac and he’s trying to figure it out. While he’s playing with it, someone snapped this shot and posted a misleading headline?